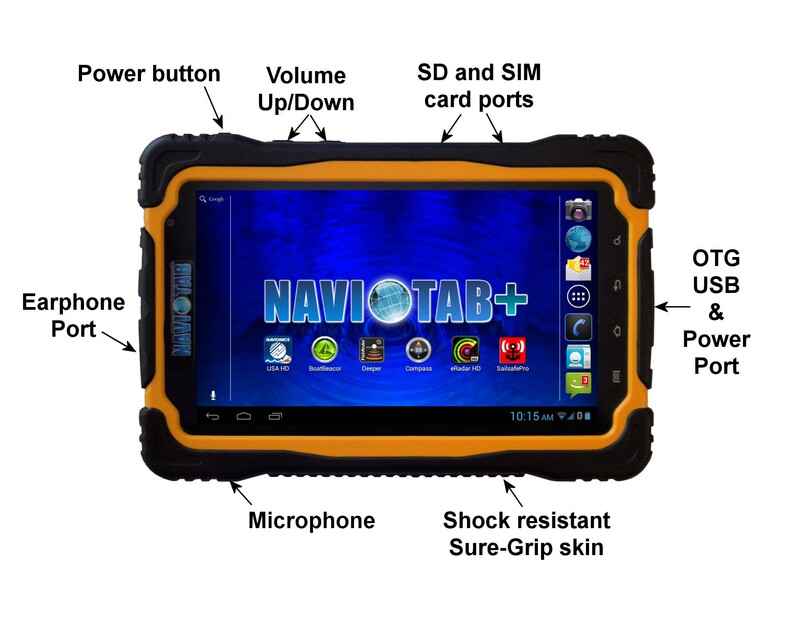 The NAVIOTAB+ tablet has been introduced by IntelliWeather Inc., a provider of weather instrumentation, weather display systems, and weather content and comes pre-loaded with ready to run applications and navigation charts for the United States. The user has options to purchase additional navigation charts for most regions of the world provided by NAVIONICS of Wareham, MA, a leader in electronic marine navigation charts. NAVIONICS has certified the NAVIOTAB+ in their testing laboratory for use with their electronic marine navigation software and charts, and it comes ready to run with NAVIONICS software and free access to government marine charts with options to upgrade to the more detailed and up to date NAVIONICS charts. In addition, in an agreement with PocketMariner of the United Kingdom, the NAVIOTAB+ comes ready to use with a fully operational AIS collision avoidance system. Making use of the built-in GPS and Internet connectivity capabilities to provide a real-time AIS radar like display of vessels near your position in highly trafficked ports and navigable waterways worldwide. This provides an extra level of accuracy and protection allowing you to “see and be seen” with or without MMSI registration. Sporting a Quad-core 1.2 GHz A9 processor, 1 GB of RAM, and 8GB of FLASH storage, the NAVIOTAB+ is fast and responsive. Storage can be expanded up to an additional 32GB with insertion of a micro SD storage card. The bright 7” screen is protected by toughened scratch resistant glass and can be seen in daylight, plus offers automatic dimming for night use. The built-in GPS receiver system does not require an external antenna, and is accurate to within 3 meters (10 feet).